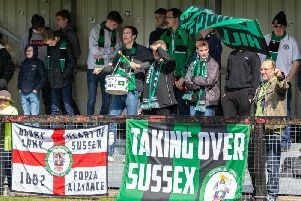 Burgess Hill Town Ian Chapman has said he does not want to go through another season like this after his side avoid relegation on the last day of the season. The Hillians lost 3-2 to Harrow Borough but Totting and Mitcham’s 2-0 defeat to met Police meant Chapman’s team survived on the lady - for the third consecutive season. Despite the elation of the staying up, Chapman knows it has not been good enough. He told Middy Sport: “Last year were got safe on the last game of the season, we scored in the 98th minute and it was all rosy and everything was great. “But it wasn’t good enough and what it probably did was paper over a lot of the cracks at the club with certain players etc and we went with them again. On Saturday if we had won two or three nil away from home and been safe and we might have felt the same. Chapman added: “It’s still a successful season because we stayed up and that’s great. I am delighted but it’s been hard and I don’t want to go through another season like it because it is stressful and it’s too much.